The purchase of a Rolex is a milestone – few style-related investments say “I've made it” like a Rolex. Both as a brand and as a physical object, it's one of the most recognizable status symbols in the world. But Rolex's ubiquity doesn't make them one-size-fits-all. 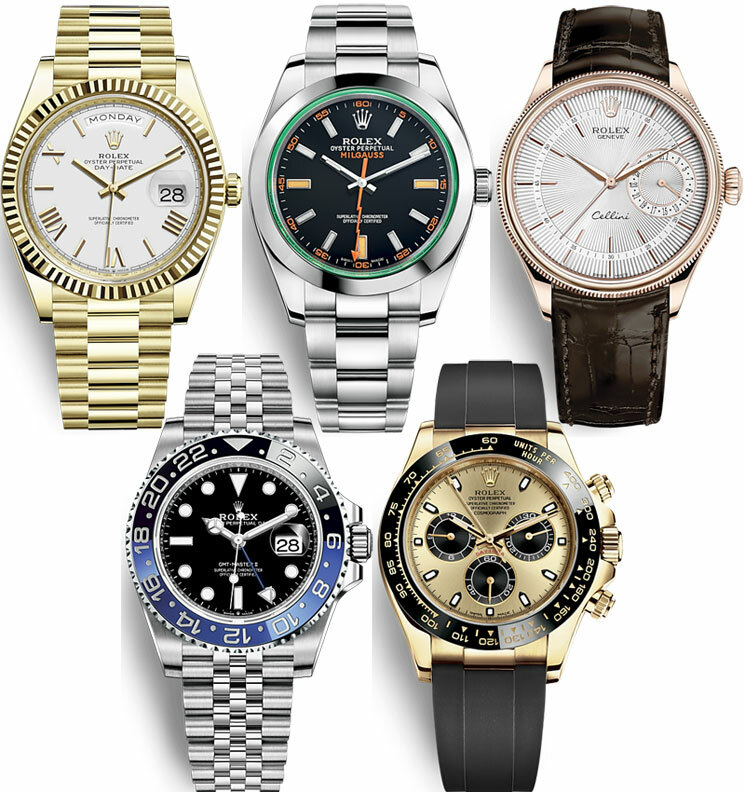 Read on to learn how to buy the RIGHT Rolex for you – and be savvy when purchasing it. I'm going to be going into a lot of detail in this article because I want to give you the ultimate guide to understanding and buying your first Rolex. It's basically an ebook. In fact, I've made you an ebook version you can download and refer to any time you like. Rolex is THE name in status-symbol watches. They’re the most instantly recognizable watches in the world thanks to their standard case designs and limited bracelet selections. Even non-watch geeks recognize them and know the clout they signal. 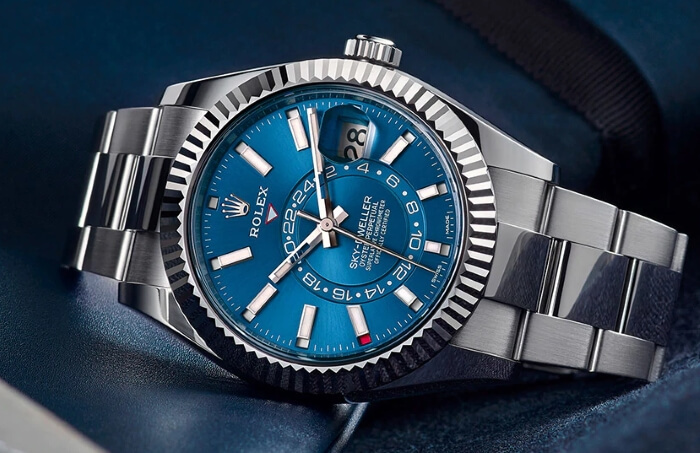 A survey of wealthy Americans (household income over $100,000) by investment bank RBC Capital Markets found that 12.3% want to buy a Rolex in 2019 – no other watch came close. 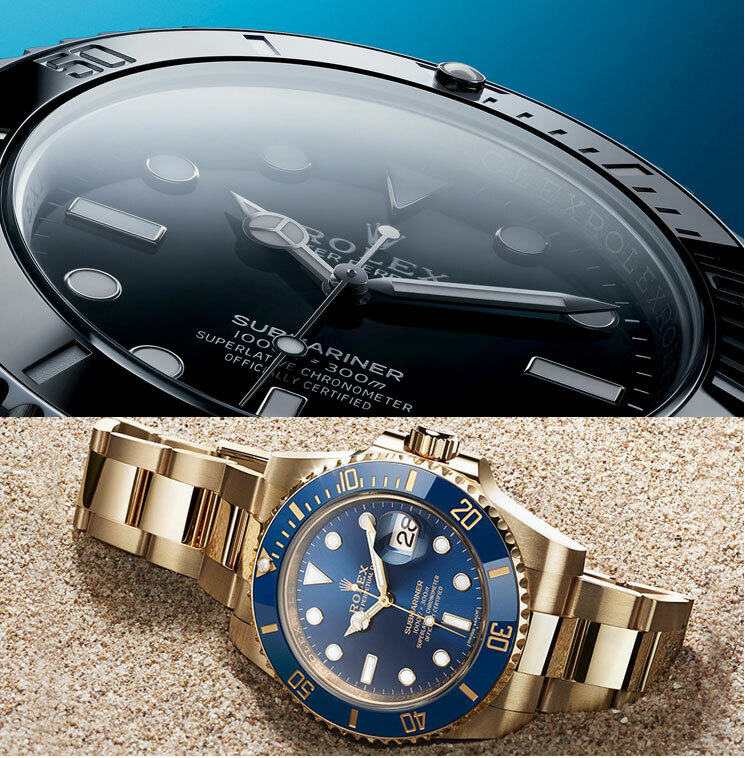 A 2019 study by the Reputation Institute ranks Rolex as the world’s most reputable company. Before watches were luxury items they were tools. 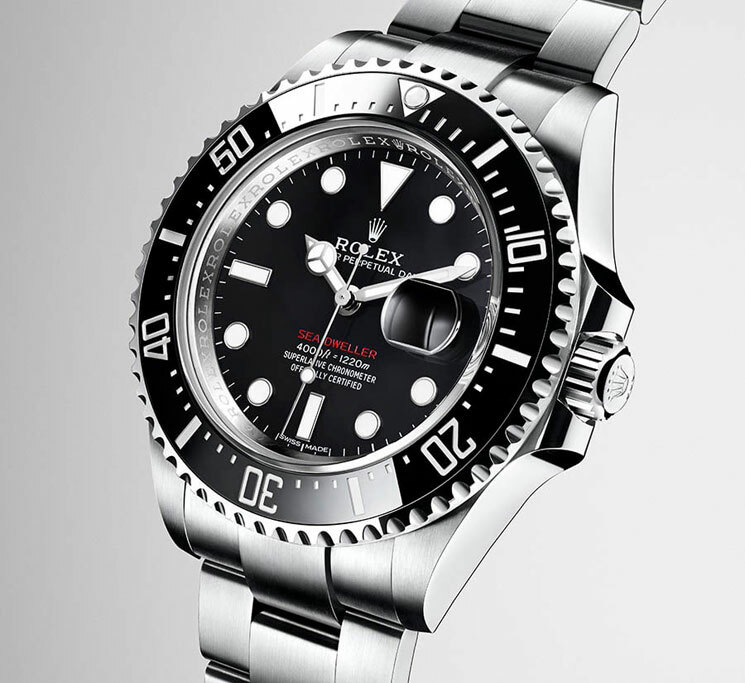 Rolex built a reputation for being the most reliable watch, especially for dive watches – the Submariner (1953) was the first watch waterproof to 100 meters. Rolex REALLY tests its watches. For example, all Oyster Perpetual models are tested under water pressure 10% higher than their rated depth, and dive watches are tested at pressure 25% higher. Rolex is an industry leader in precision, and was the first in the world to receive a Chronometric Precision certificate. Today all Rolex movements have chronometer certification. Plus they test the cased-up watch to +2/-2 seconds' deviation per day. Rolex is one of the only watchmakers in the world to make almost every component “in-house,” including the metals it uses. It has its own gold refinery and makes alloys that can’t be copied by anyone else. When you buy a Rolex, you're buying a timepiece with a heritage that stretches back through time. 1905: Hans Wilsdorf and his brother-in-law Alfred Davis start a watchmaking company in London, calling it ‘Wilsdorf & Davis'. 1919: Rolex moves to Geneva, Switzerland, where its headquarters remain to this day. Geneva has been the heart of the luxury watch industry since the 16th century, when a Calvinist ban on jewelry drove out-of-work jewelers to team up with watchmakers. 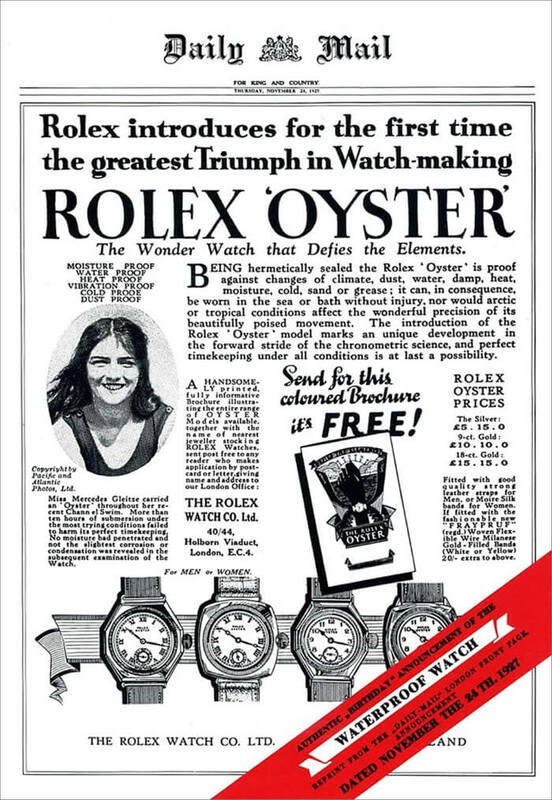 1926: Rolex invents the first waterproof watch, the Rolex Oyster – endorsed by Mercedes Gleitze, the first British woman to swim the English channel. Rolex took out this full-page ad in a British newspaper to capitalize on Mercedes Gleitze's endorsement. 1931: Rolex invents the first self-winding watch – the Oyster Perpetual. 1945: Rolex invents the first watch with a date – the Datejust. 1945: In defiance of the neutrality policies of most Swiss businesses, Wilsdorf replaces thousands of confiscated Rolexes for Allied POWs, who use them in the Great Escape. 1953: Edmund Hillary and Tenzing Norgay take a Rolex with them as they become the first men to set foot on the summit of Mount Everest, the highest place on earth. 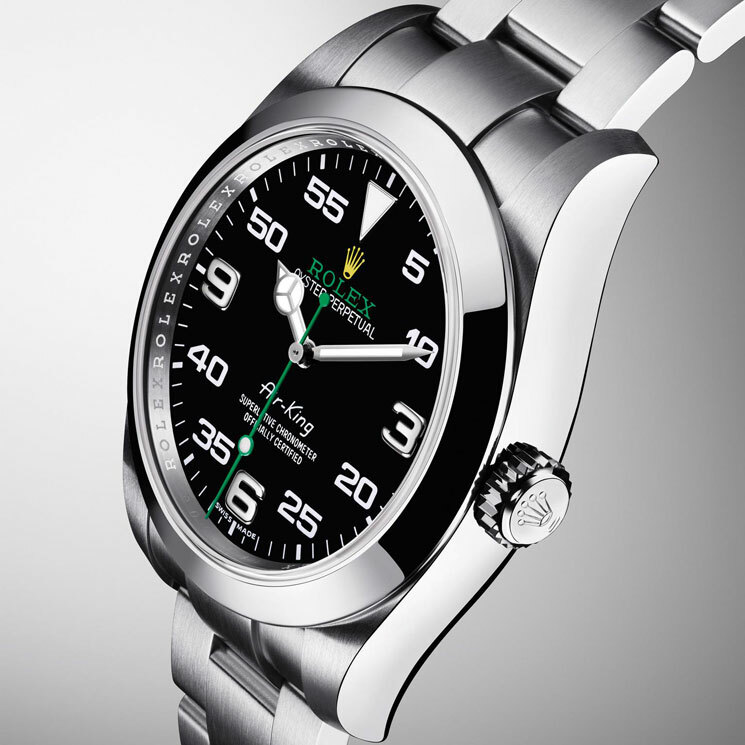 The Rolex Explorer is subsequently named in their honor. I own this one! 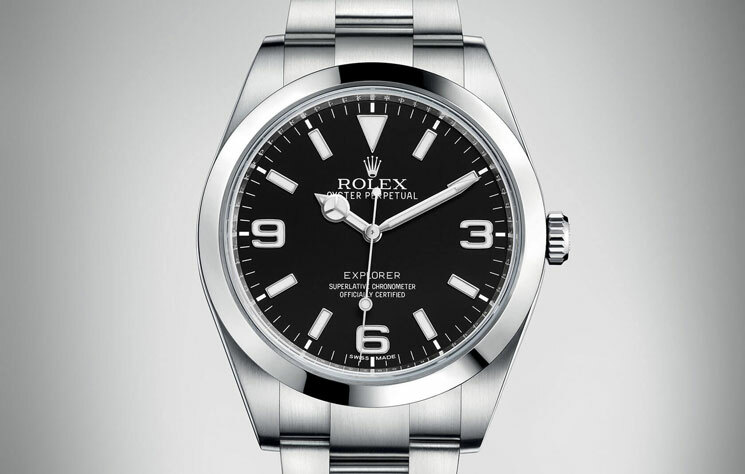 Click here to read my Rolex Explorer review and history. 1960: A specially designed Rolex is also carried to the LOWEST point on earth, Challenger Deep – 10,911 meters underwater. 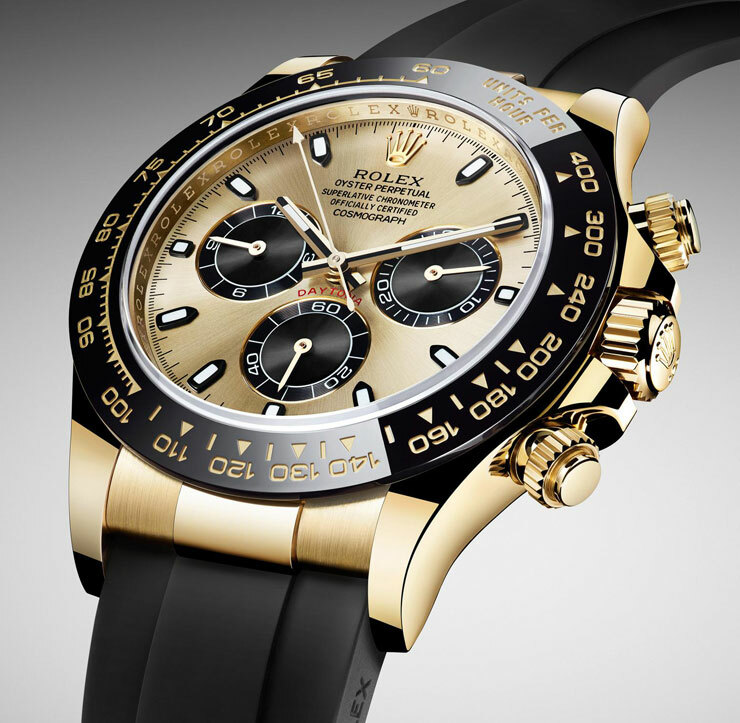 1963: Rolex invents the first racing chronograph – the Cosmograph Daytona. 1970s: The ‘Quartz Crisis’ decimates the Swiss watch industry – the market is flooded with cheap Asian quartz watches. Rolex keeps making mechanical watches, markets itself on heritage and craftsmanship, and becomes the prestige brand for yuppies in the 1980s. Case – the ‘body’ of the watch, which houses the internal moving parts. Notably, almost all Rolex watches have solid, screw-down casebacks, which sets them apart from more common snap-on casebacks or those with external screws. Crown – the knob on the side that’s used to wind and stop the watch and/or adjust the time and date. A Rolex crown is marked with a crown logo and screwed hermetically onto the case, making it waterproof. Crystal – the transparent, convex crystal that covers the face of the watch. Since the 70s, Rolex has been using a synthetic sapphire to make their crystals. Bezel – the round outer ring that seals the case. 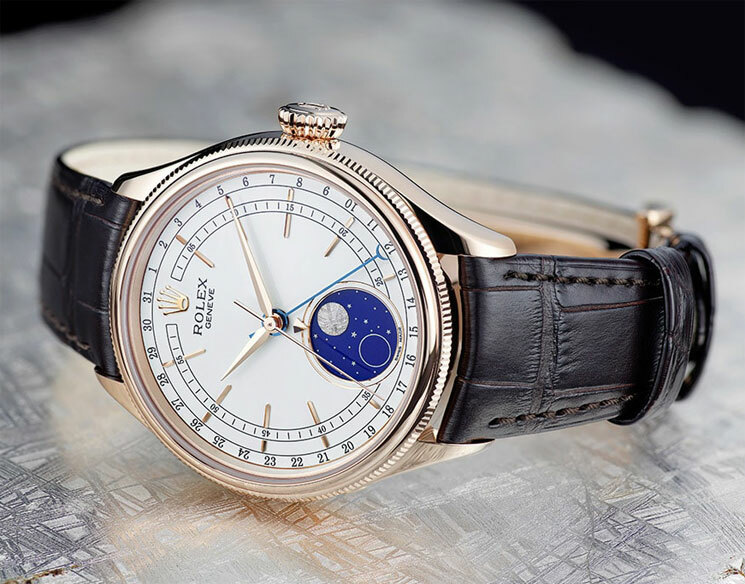 Many Rolexes have a fluted bezel – first used to screw the bezel onto the case, then for rotatable bezels, and now also just as a distinctive decoration. Bracelet – a metal band that you use to wear the watch on your wrist. A Rolex bracelet often comes with a concealed ‘Crownclasp’ that makes the bracelet look endless. Lugs – the protruding edges of the watch itself that attach it to the bracelet. Model – the outer design of the watch; each Rolex model has a reference number that will tell you the year and version as well as the caliber. 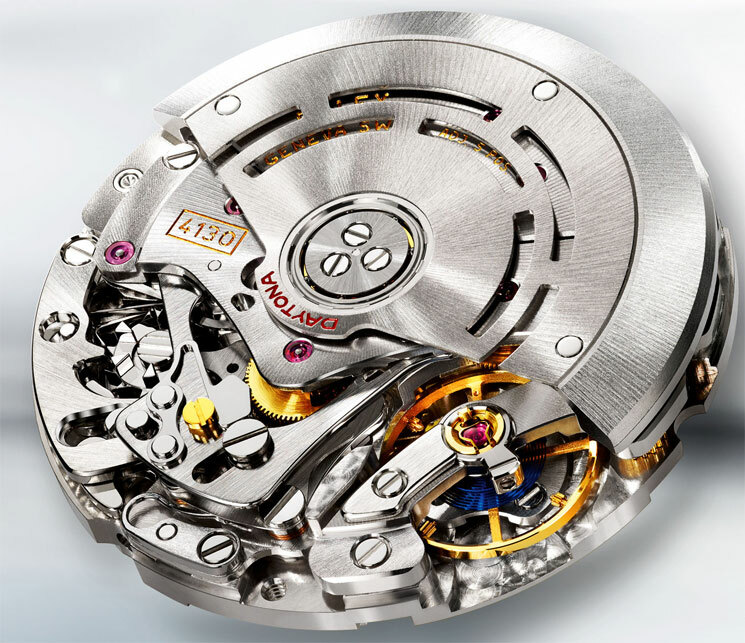 Movement/caliber – the type of mechanics inside the watch. Complication – any function on a timepiece that does more than telling time (displaying hours, minutes, and seconds) – such as the extra dials on a chronograph. Lume – glow-in-the-dark paint applied to hands and numerals. Spring/Mainspring – A coil of metal that powers the watch. Winding tightens it, and its gradual unwinding turns the gears. Balance wheel – Part of a watch that swings to divide time into equal parts. Escapement – the part that regulates the flow of energy from the spring to the balance wheel. 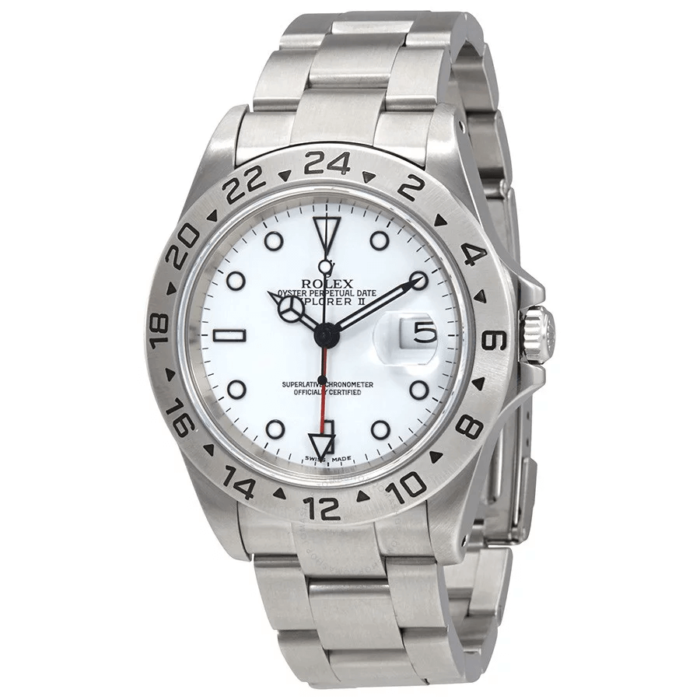 Aftermarket Rolex Parts – non-Rolex made parts that do not display counterfeit Rolex logos or hallmarks. Bubbleback – used to describe the early Rolex Perpetual models, because they have a thick case to house the oversized movement. Concealed Clasp/Crownclasp – a clasp that’s concealed under the bracelet's links, making the bracelet look like a continuous loop. Cyclops – A tiny magnifying glass on the crystal to magnify the date – patented by Rolex in the 1950s. Helium Escape Valve (HEV) – A valve co-developed by Rolex and Doxa to let gases escape from a watch case when a diver resurfaces (otherwise the crystal can pop off as they decompress). Oyster – The name Rolex founder Hans Wilsdorf gave to the first waterproof watches from the 1920s. Still used in many model names and Rolex terms. Perpetual Movement – an automatic or self-winding movement, which causes a weight inside the watch to rotate backwards and forwards, keeping it in constant tension. Reference number – on the 12 o’ clock side of every Rolex; describes the materials and construction of that particular model and version. The last digit shows the material: yellow gold is 8, white gold is 9, steel is 0, platinum is 6. Sweeping Movement – refers to the movement of the second hand quickly ‘ticking' at approximately 5-8 times per second, thus giving the illusion of sweeping, instead of the jerky tick-tock movement of regular watches. The proliferation of Rolex models can seem confusing. But when you break them down into their components, it's easy to understand the differences between models. 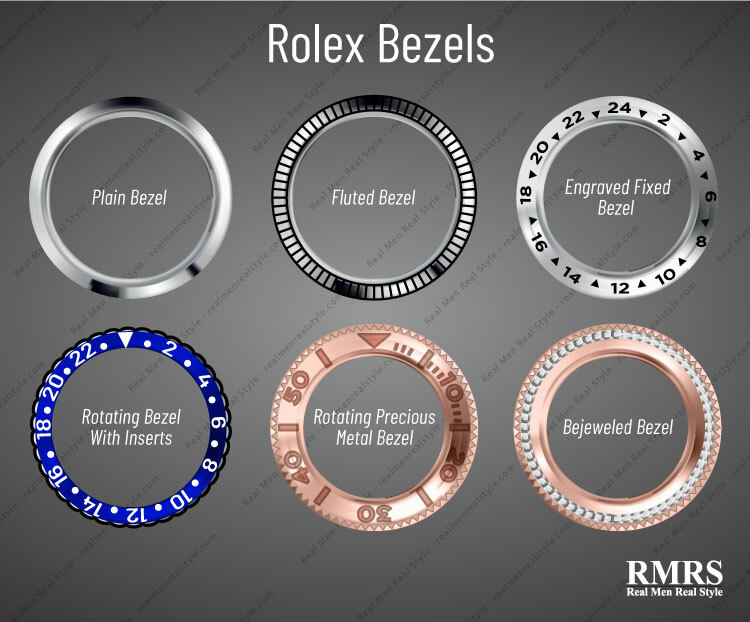 All Rolexes are made from different combinations of 9 basic materials, 2 clasps, 2 clasp expanders, 6 bracelets, and 6 bezels. Platinum – Rolex uses 950 platinum (950 thousandths of platinum, generally combined with ruthenium) – makes it robust enough to use in watch cases, without losing its shine. White Gold 18k – Rolex’s white gold seems to radiate light. Yellow Gold 18k – Rolex’s own gold alloy with an iconic color. Everose Gold 18k – a rose gold that gets a unique color from added silver and copper and doesn’t fade in sunlight. Oystersteel – Rolex’s own steel superalloy. A 904L steel – as resistant to corrosion as precious metals. Also has an exceptional sheen when polished. 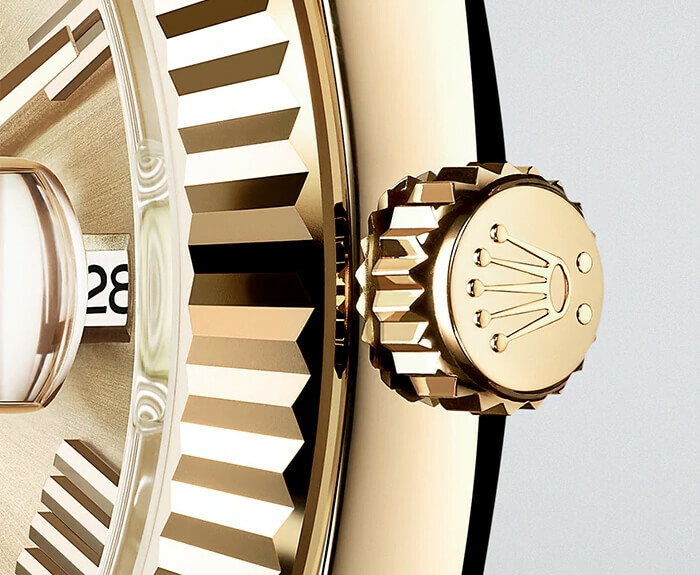 Rolesor – The combination of Oystersteel and gold in a two-tone Rolex. The name Rolesor was patented by Rolex in 1933. In yellow or Everose Rolesor the bezel, winding crown, and center bracelet links are gold, in white Rolesor models only the bezel. 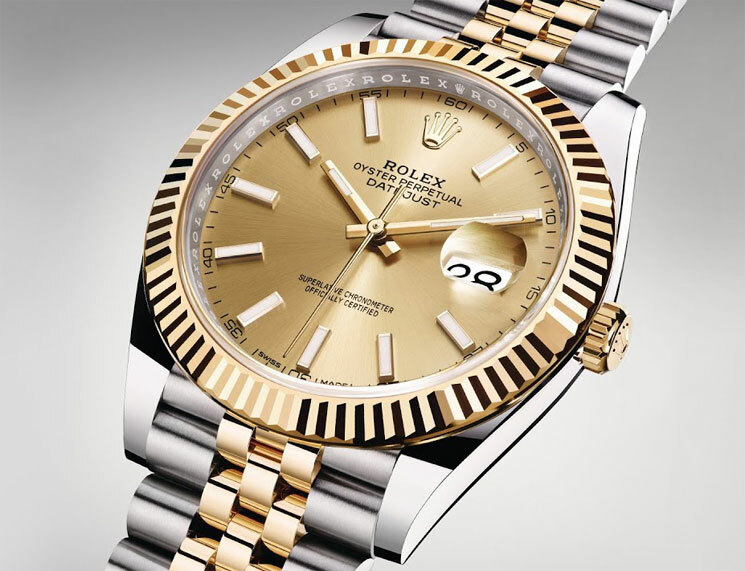 This Rolex Datejust is made with Rolesor. 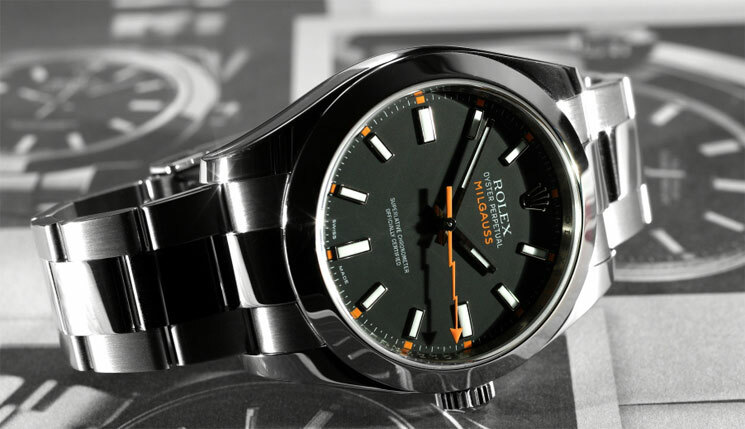 Chromalight – Rolex’s lume. Looks white in daylight, glows blue in the dark. Precious Stones – All kinds are used but diamonds are most common. Cerachrom -Rolex’s proprietary ceramic used in bezels – scratch-proof and UV-proof so the color won’t fade. Crownclasp/Crownlock – Smart clasp that’s almost invisible when closed. Here you can see how ‘invisible' the Crownclasp is. 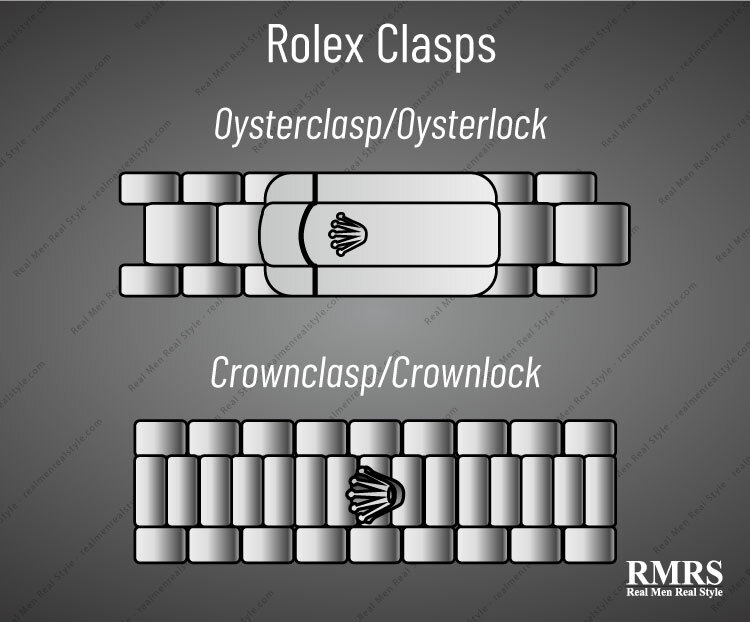 Oysterclasp/Oysterlock – Rolex’s most popular and most secure clasp, with an extra locking mechanism that folds over the main clasp. Glidelock – Allows up to 20mm expansion in 2mm increments – made for divers to wear over wetsuits. Jubilee Bracelet – Five-piece links, used in dress and sport watches and comes with either an Oysterlock or a Crownlock clasp. Oyster Bracelet – Larger three-piece links for a sportier look. Only comes with an Oysterlock clasp. President Bracelet – Less common, uses elegantly rounded three-piece links and only comes with a Crownlock clasp. Here's a handy visual guide to the different Rolex bracelet types. Pearlmaster Bracelet – Rolex’s most elegant bracelet, with five-piece links and a Crownlock clasp. 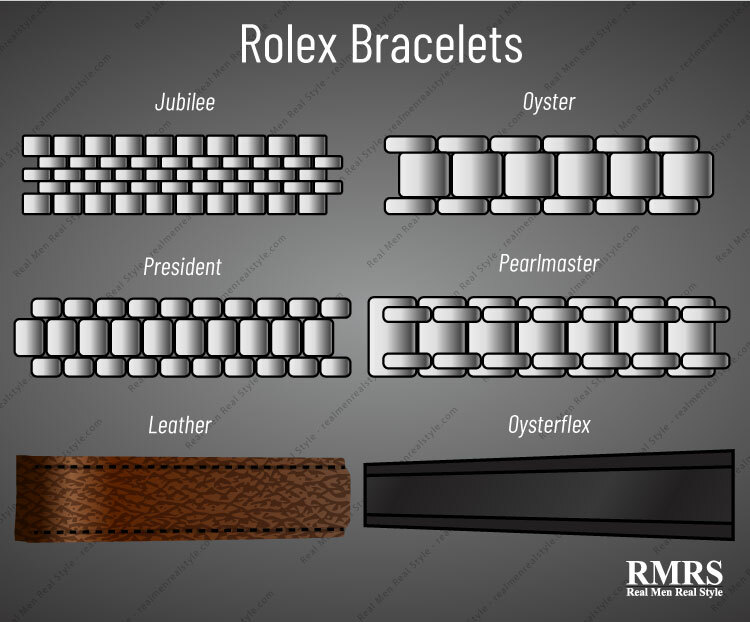 The Rolex Leather Bracelet – Comes in a variety of colors and hides, with an Oysterlock clasp or a simple pin buckle. Plain Bezels – Come in steel and in precious metals. Fluted Bezels – Only available in precious metals. Engraved Fixed Bezels – Found only on the Explorer II and the Daytona Cosmograph. Demarcations are engraved into either Oystersteel, a precious metal, or Cerachrom. The rotating bezel with inserts is made from Cerachrom and comes in a wide range of colors and color combos. Rotating Bezels with Inserts – Used in the Professional watches. Inserts are made from Cerachrom. 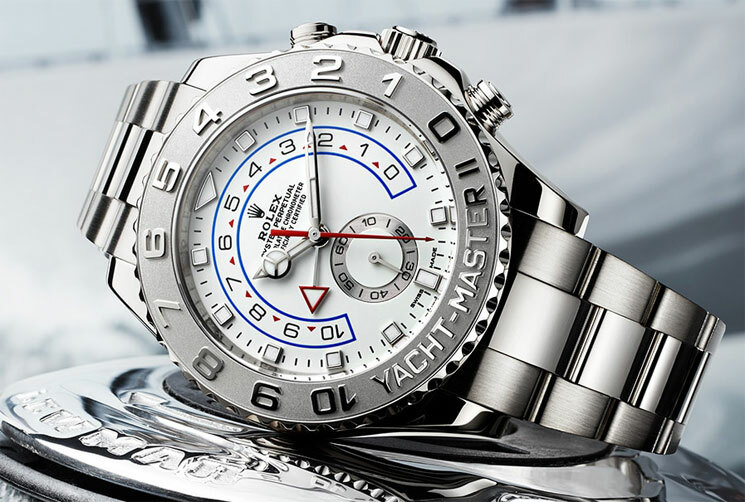 Rotating Precious Metal Bezels – Sporty but elegant, deeply engraved bezels exclusive to the Yachtmasters. Bejeweled Bezels – Most bezels also come encrusted with precious stones. 3255 – Highly accurate movement introduced in 2015. Rolex says it’s accurate to +3/-2 secs/day, which is double the standard set by the official Swiss testing institution. 3235 – Next-generation caliber introduced in 2016. Replaces more than 90% of the parts of Rolex's previous superstar movement, the 3135. Comes with a new escapement, the Chronergy, which is 15% more efficient, and a 70-hour power reserve (meaning it runs for three days without winding down). 4130 – The chronograph movement used only in the Daytona, with no date. The caliber 4130 that powers the Daytona. 9001 – Includes 2 time zones and an annual calendar. This is the most complicated Rolex movement, and available only on the Sky-Dweller. Oyster Perpetual Classic – Versatile waterproof watches in classic styles. 6 models available. Oyster Perpetual Professional – Specialized performance sport watches. 7 models. Cellini – Traditionally styled, mostly-dressy watches. Less waterproof than the other categories but still water-resistant. 4 models. A very popular racing watch made in very limited numbers. Unless you have a great relationship with your local authorized dealer, you’ll have to get on a waiting list for a new one or pay more for a used model. This Daytona comes with an Oysterflex rubber bracelet. Curious about the price? Click here to find out what Daytonas are going for on Rolex's website. 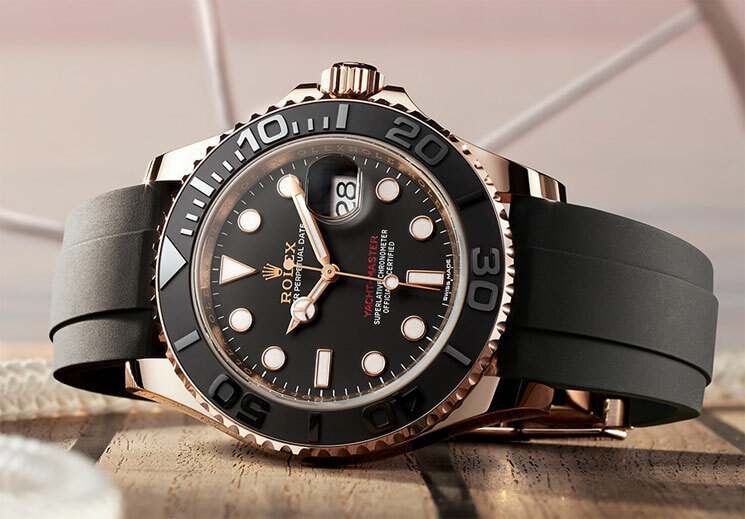 Rolex’s largest watch – a heavy-duty dive watch available in Oystersteel and (new for 2019) yellow Rolesor. The Deep Sea version of the Sea-Dweller went to the bottom of the Mariana Trench with James Cameron. 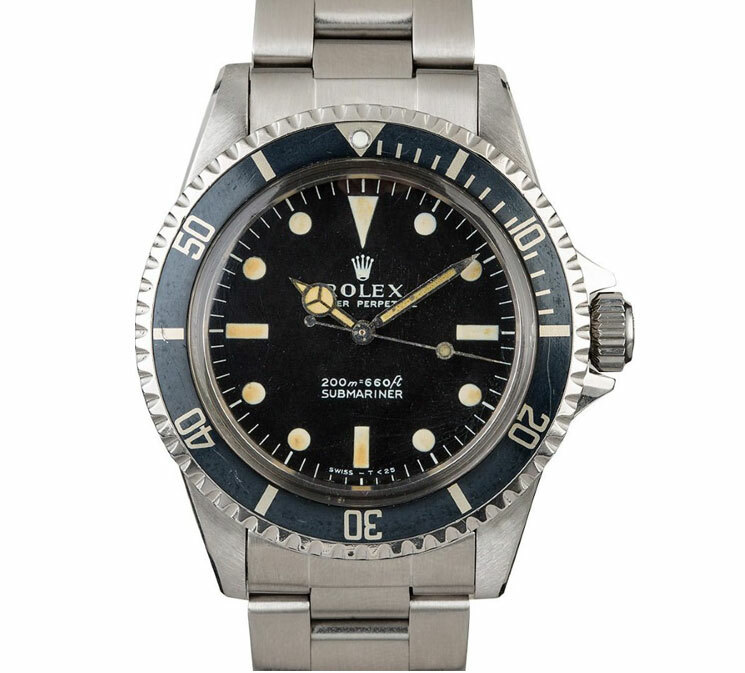 The most popular and iconic Rolex – a dive watch worn by James Bond and Steve McQueen. A great watch but ubiquitous. The basic black model in steel is the favorite. 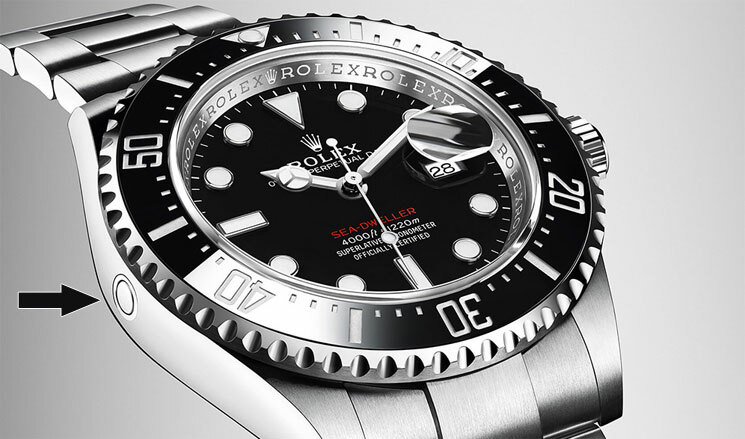 Click to discover more about the iconic Submariner on the Rolex website. Pilot watch with a range of colorful two-tone bezels with soda-related nicknames, like Pepsi (red and blue bezel), Coke (red and black), and Rootbeer (light and dark brown). 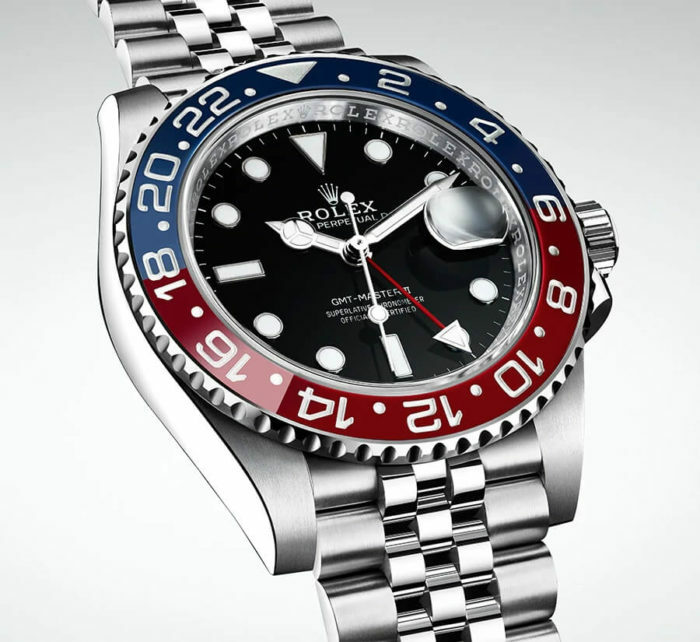 This GMT Master II has the celebrated ‘Pepsi' bezel. The watch that went up Everest with Hillary and Tenzing (though it wasn’t named the Explorer until afterwards). Extra legible for tough weather conditions, with numerals at 3, 6, and 9 o’clock. 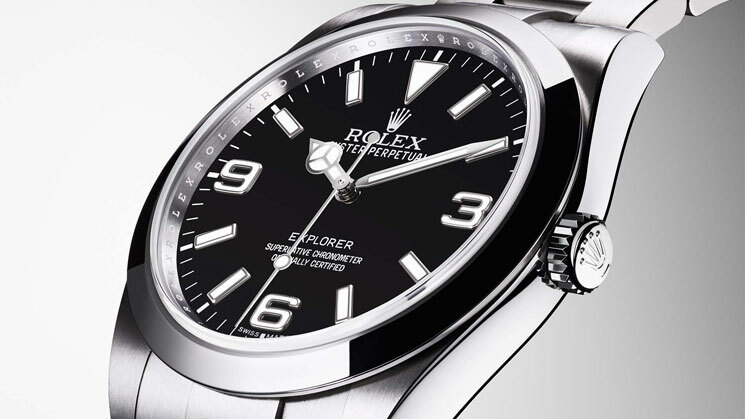 Click here to explore the history of the Rolex Explorer. Developed for caving and other dark environments, this version is larger than the original Explorer. The highly visible bright orange 24-hour hand makes the Explorer II easier to read in low light. A hip, playful-looking watch with a lightning-bolt-shaped orange seconds hand and green-tinted crystal. The Milgauss can withstand electromagnetism – it was designed for working in electric plants in the 1950s. Marketed after WWII as an aviation watch because so many fighter pilots used Rolex Oysters for the legibility and accuracy. The Air-King dial features both hours and minutes – some people love it and some hate it. Yachting watch with a bezel that rotates both ways for timing boat races. A dressier sport watch. Want to see a first-hand opinion of the Yacht-Master? Click here. Yachting watch with a countdown chronograph programmed by rotating the bezel and crown. The Yacht-Master II boasts the biggest case size of any Rolex. 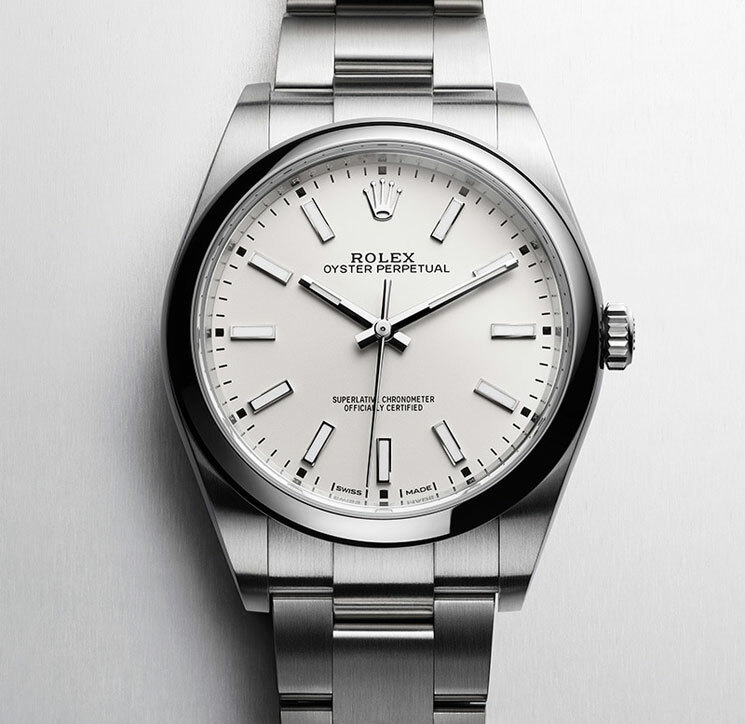 This three-hand, time-only watch is Rolex’s most basic – a direct descendant of their original Oyster watches. The Oyster Perpetual works as a sport or dress watch. 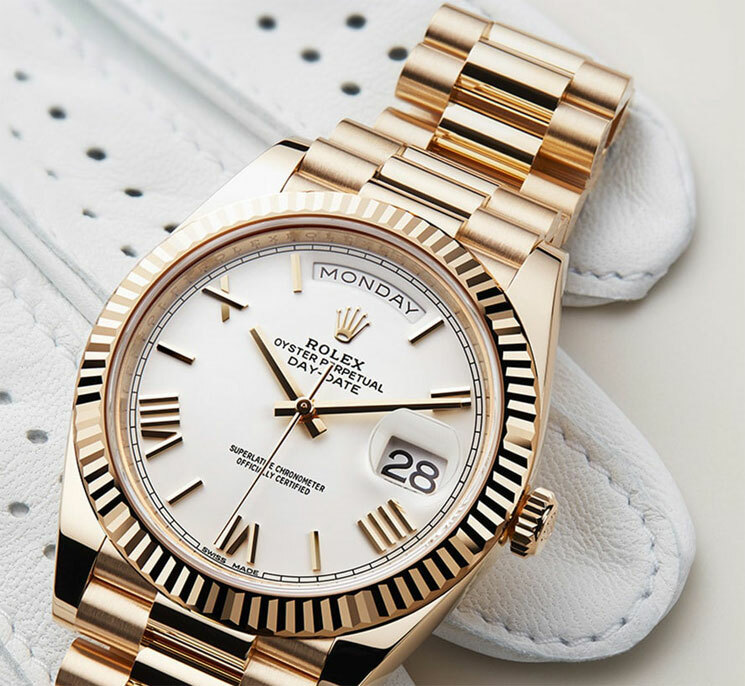 The Rolex Datejust is an iconic dress watch, named because “the DATE changes JUST before midnight” rather than taking hours to change like most date wheels. Click here for an in-depth article on the Datejust. Case Size: 28mm, 31mm, 34mm, 36mm, 41mm)Water Resistance: 100 meters/330 feetMovement: 2236 (28mm model and 31mm model); 3135 (34mm model); 3235 movement (36mm model and 41mm model)Movement Features: Date complicationDial: Many options – you can customize your Datejust onlineBezel Type: Many options – smooth, fluted, diamond-encrustedBracelet Type: Can be dressed down with an Oyster bracelet or dressed up with a Jubilee bracelet. Basically a Datejust with a day of the week feature, generally offered in fancier configurations than the Datejust. Only comes in gold or platinum. Vintage gold Day-Dates from the 70s are relatively cheap. The Day-Date is sometimes called the President because so many world leaders have worn it. A Datejust covered in ethically sourced precious stones. This is the blinged-out Rolex – if you're buying a Rolex for the first time you're likely to find both the look and the price a bit much. 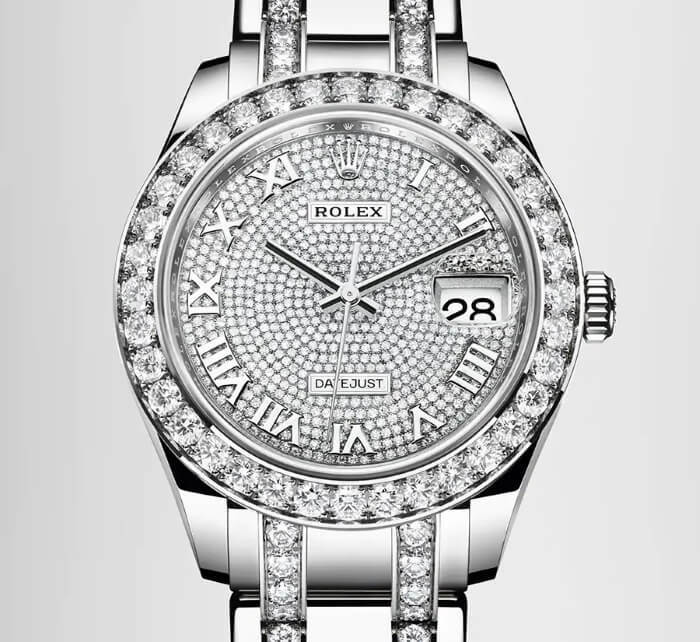 The Rolex Pearlmaster is named for the mother-of-pearl dials on some models. This one, however, is covered in diamonds. Looks like a steel watch, but that bezel is white gold – the Sky-Dweller also comes in all gold. Rolex’s dress watch line, only available in precious metals. According to their catalog, it uses “sober and refined lines, noble materials, quality finishings: every detail respects the codes of the art of watchmaking.” Notably, Barack Obama wears one. This beautiful model is the Cellini Moonphase. 9. The Stages Of Buying A Rolex Step 1: Are You Mentally Ready To Buy A Rolex? Before you spend any money on a Rolex, you need to have these three things lined up. Wait to buy a Rolex until you can pay for it in full – do NOT use a credit card. It’s simply too risky. You don’t want to ruin yourself financially because you’re making payments with 20% interest on a small item that can be lost or stolen relatively easily. Sure, it’s terrible if something happens to your paid-off Rolex too, but you won’t be in debt because of it. Be honest with yourself about why you want this watch. For the vast majority of us, it’s going to be a bit of an ego thing. This is a status symbol, and a traditional marker of success. It can be simply a way to impress people. Take a look at how you’re feeling about this purchase. You don’t want to do it just because you feel like you should. At the end of the day, you should be buying it for yourself – whether it's to celebrate making your first million, to appreciate great craftsmanship, or to remind you daily of whatever it was you bought it for. Life has its ups and downs, but the achievement that put you in a place to securely buy a Rolex is something permanent that nobody can take from you. The more you know about Rolexes, the better deal you’re going to get. If you want to walk into a store and drop the full retail price, more power to you. But it seems safe to say that most of us are looking to get the most value we can out of such a major purchase. You don’t have to spend a hundred hours studying – but if you’re looking for a watch you can wear every day for the rest of your life, talking to a consultant who specializes in watch buying or joining a watch forum can help you gain the best possible understanding of your options. When you simply walk into a store, you’re only seeing a small sample of what’s available in the Rolex universe. But if you dive into research, you may discover that the right watch for you is something that’s available at a store in the next town over or that came out a decade ago but might be reissued soon. You might fall in love with a vintage model and buy one used. Look beyond the obvious – years down the line, you’ll be glad you did. Step 2: What Rolex Is For You? Do you want a sport watch or a dress watch? Dress watches are smarter, but look wrong with jeans and a t-shirt, while a sport Rolex can still be worn with a suit. If you’re on the fence, an Explorer or Explorer II is versatile. Do you plan to wear it every day or just on special occasions? Getting your first Rolex is like getting your first tattoo—it should be something you’ll still be proud to wear in 30 years. Avoid edgy fashion statements, flashy bling, colored dials, oversized cases, and the latest updates to classic models (unless it's the new 116710 BLNR, a two-tone blue-black bezel, which is widely regarded as a new classic). You can see why the 116710 BLNR is known as a modern classic… and why it's known as the ‘Batman' bezel. Go to a store and try a few on. See how they look on you and how they make you feel. The right watch ‘sings’ to you – you'll instinctively know that it's yours. This is the easiest route for first-timers – the pre-owned luxury watch market is confusing. Also, a first Rolex is a milestone – especially if you’re celebrating or commemorating something, it’s nice to have it be just yours. Rolex makes subtle design updates to several of its models each year, so a pre-owned model may not look the same. This CAN be cheaper than buying new – but do cross-check prices with the new model, because it actually isn't always. On the upside, Rolex quality means pre-owned models are usually good as new. But do make sure you choose a reputable dealer with a repair and warranty guarantee. ‘Vintage' usually refers to a Rolex over 30-50 years old, but is sometimes applied to any Rolex debuted before plastic casings. Common vintage models can be cheaper than new, but rare ones can be much more expensive. Also be aware that the standard men's watch size used to be a lot smaller. Vintage Rolex cases are often 34mm or less, which can look feminine to modern eyes. Plus it can be hard for a first timer to choose a vintage Rolex model, find a good deal, and avoid getting scammed. However, a vintage Submariner is a good choice – stylish, versatile, not too small, and often cheaper than new. A vintage Rolex is more likely to need servicing – so it's even more important to get a guarantee. You cannot fly blind when it comes to luxury watch shopping – it’s an art and a science. Learn more about the world of watch dealers and auctions by “window shopping”. Study articles from respected online publications like Hodinkee, A Blog to Watch and Time & Tide. Once you feel confident in the basics, visit the Rolex Forums. This is where Rolex aficionados hang out. The pool of information can be overwhelming, and watch geek culture is exclusive, so it helps to know the history & speak the language first. Start to get a feel for what styles and features you could live with for a long time. It’s easier to intuit this gradually than make yourself choose in the heat of the moment. Step 5: Where to Buy? The best place for buying a Rolex is an authorized dealer, one inspected and certified by Rolex (a directory of authorized Rolex dealers is available on their website). Check up on their reputation via the internet – if they’ve been around a while there will likely be discussion about them somewhere, and if they’re new you can see how well they follow up on customer questions via their social media. If you can, choose a local authorized dealer and start building a relationship with them. 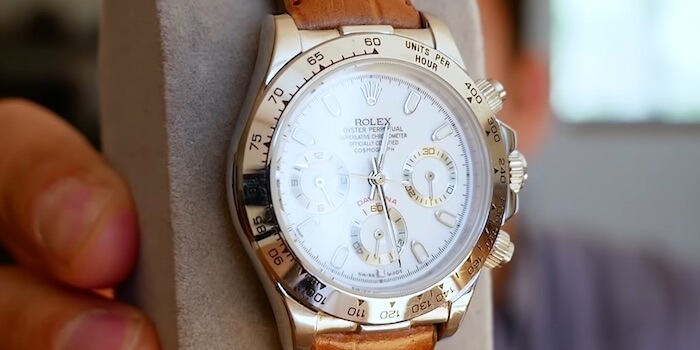 99% of the time you need to make many purchases with the same dealer before they’ll sell you a high-demand, hard-to-get Rolex like a stainless steel Daytona. A lot of authorized dealers also won’t sell to customers who aren't local because of too many people buying Rolexes just to sell them immediately for a profit. Dealers want to build a relationship with local customers who will give them repeat business and actually appreciate the watches. Rolex discourages authorized dealers from giving discounts. For the popular stainless steel models, you're very unlikely to get a discount – you may even have to pay extra due to the demand. For higher-priced precious metal Rolexes, and for second-hand and vintage models, there may be room to negotiate, especially if you know the dealer. All authorized dealers will offer a warranty for repairs and maintenance. All new Rolexes carry a five-year warranty, and you should ALWAYS get a warranty for a secondhand or vintage Rolex. 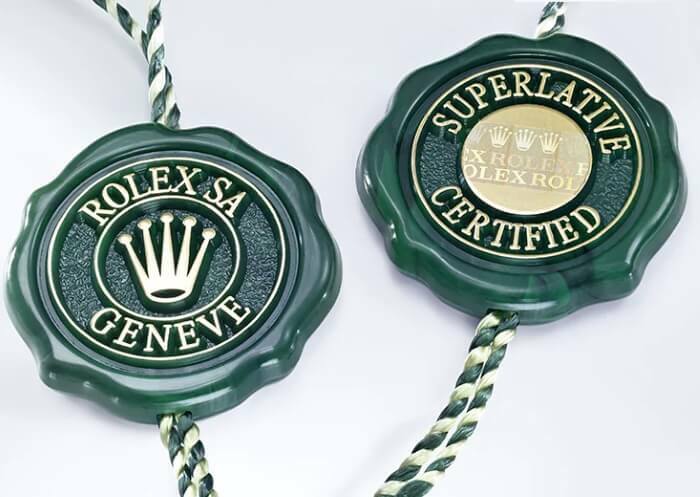 Your new Rolex will come with these green tags, signifying a five-year warranty. Physically handle and try on the watch before buying – don’t make a $5,000-$20,000 purchase on eBay. If you get one with an Oyster bracelet, the dealer will fit it for you, adding or removing links. Rolexes hold their value incredibly well, but you generally can’t turn them around to make a fast buck. A Rolex Submariner will likely appreciate up to 5% per year. Some vintage models have skyrocketed in price in recent years. If you do think you might sell yours someday, make sure you keep the box and receipt, as these will increase the resale value. All that said, you can never be certain that you’ll make a profit selling a pre-owned Rolex. Buy it for itself, not how you think it might pay off someday. Is buying fake worth it? In a word: NO. You’ll always worry that someone will spot the fake. You won’t feel confident, you’ll feel bad about yourself. Click here to find out how a whole collection of fake Rolexes will make you feel (this one's a fake Daytona). Using cheap products makes you feel cheap – it can even decrease performance on seemingly unrelated, but important, tasks. In a study published in 2011 in the Journal of Experimental Social Psychology, two experiments were done to see the effect of using generic products on two unrelated tasks – one was business-related, and one dealt with romantic attraction. Those who used the GENERIC products scored themselves significantly lower on self-worth (how much salary they felt they were worth), and lower on whether their “partner” would find them attractive. Those using the AUTHENTIC products felt more attractive, and rated their self-worth as higher. Wait till you can afford to buy a real Rolex with your own earnings, and it’ll be a meaningful symbol of your achievement. If the authorized dealer option isn’t available and you’re going through, for example, an antique dealer for a secondhand watch, here are some tips to spot a possible fake. The most important (and enjoyable) part of Rolex maintenance is wearing your Rolex. If it sits around for too long, lubricants in the movement can harden, causing friction or damage when the watch is moved again. If you don't wear it often, gently move it once every 48 hours or wind it at least once a week. However, don't wind your Rolex while wearing it. Lay it on a soft flat surface, unscrew the crown to position 2, wind 30-40 times and screw the crown back down. Don't worry about overwinding – your Rolex has a built-in device to prevent that. If the watch doesn't start when wound, gently rock it and wait a while to let it start. Don't shake it. If it's still not working have it checked by a certified Rolex dealer. Inevitably, your Rolex will pick up a few scratches. To minimize scratches, store it on a soft cloth or in its box at night. Remove scratches by polishing with a quality polishing cloth specially designed for stainless steel and gold. Follow the grain of the metal. About a minute of polishing with moderate pressure is plenty. However, polishing does remove a tiny amount of the surface, so don't polish brushed metal or unscratched parts, and don't use chemicals that are not designed for jewelry. Finally, get your Rolex serviced every 5 years by a certified Rolex dealer. They can also answer your questions about maintenance. Dirt can affect how your Rolex works. If it’s waterproof, follow these steps to wash it. Firstly, if you already have home and contents insurance, see what your allowance is for individual items – if your Rolex is a less expensive model, this might cover it. Also check whether you're covered for loss of valuables away from home. If this isn't enough to cover you, you have two options. Either talk to your contents insurance provider about itemizing your luxury watches, or get specialist jewelry insurance. Admittedly, specialist jewelry insurance tends to cost more (1-2% of the value of your watch per year). But you'll be dealing with someone who understands Rolexes and it won't affect the no-claims bonus on your contents insurance. If you're in the States, reputable insurance companies include Jewelers Mutual, GEICO, and GemSafe. Want to hear about my own first experience with buying a Rolex? It wasn't what I expected at all… Click here to watch the video: 5 Rolexes I Loved – And The One I Bought. And if you want a laugh after all that information (or if you're still slightly tempted by a fake) – click here to check out my embarrassing fake Rolex collection.